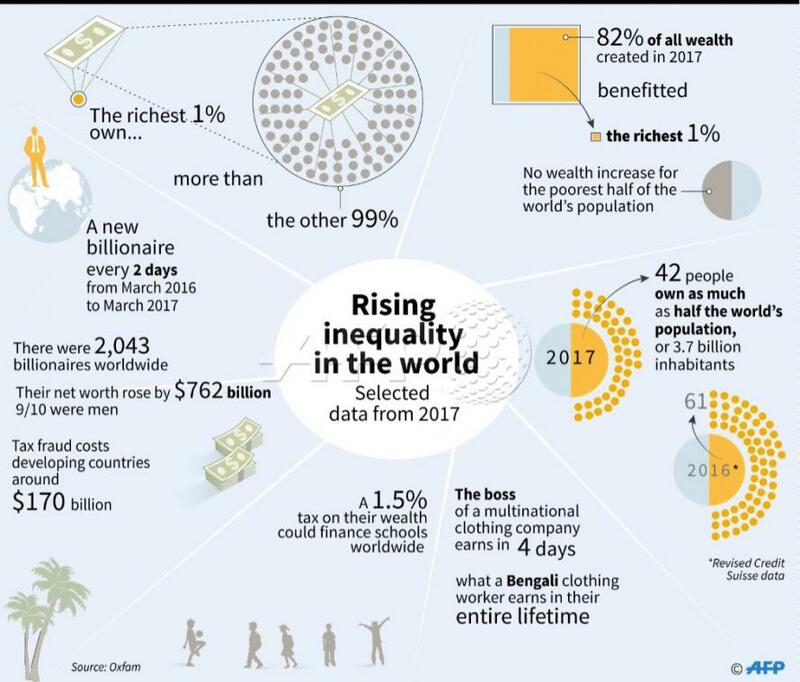 It is appropriate that as the world's richest and most popular and influential celebrities, thought leaders, economists, pundits and politicians sit down in Davos this week to discuss such topics as wealth inequality and populism, that the global charity Oxfam released its latest annual study which found that global inequality is not only worsening, but 2017 may have been the worst year ever for the split between rich and poor. There are now 2,043 billionaires worldwide, according to the report titled “Reward Work, Not Wealth." In addition to finding that the world’s richest 42 people own the same amount of wealth as the poorest 50% of people worldwide, a number that is fast approaching 4 billion, the report also showed that 2017 saw the biggest increase in the number of billionaires in history, with new ones created at a rate of one every two days. Their wealth has increased by 13% a year on average in the decade from 2006 to 2015. 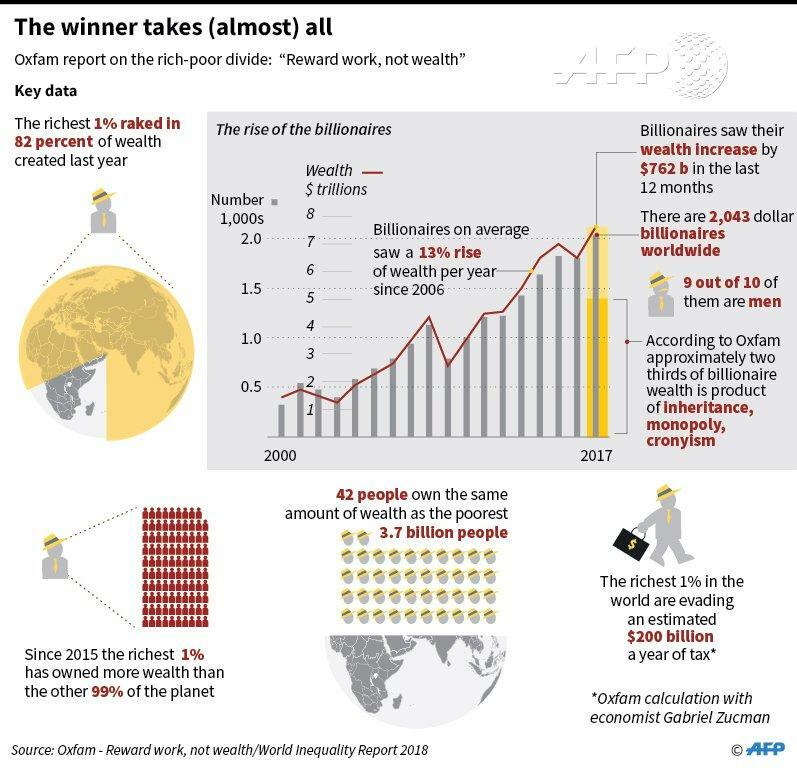 In other words, in 2017 the world's richest one % raked in 82% of the wealth created last year while the poorest half of the population received none, Oxfam said just hours before the world's elite prepared to mingle at the World Economic Forum in Davos and pretend to care about the plight of the world's poor. Just as concerning - if only in theory - to the fake warriors for wealth and income equality in Davos, is that the three richest Americans have the same amount of wealth as the poorest half of the U.S. population. Bill Gates, Jeff Bezos and Warren Buffett are the three Americans whose combined wealth matches that of the poorest 160 million Americans — about $250 billion. 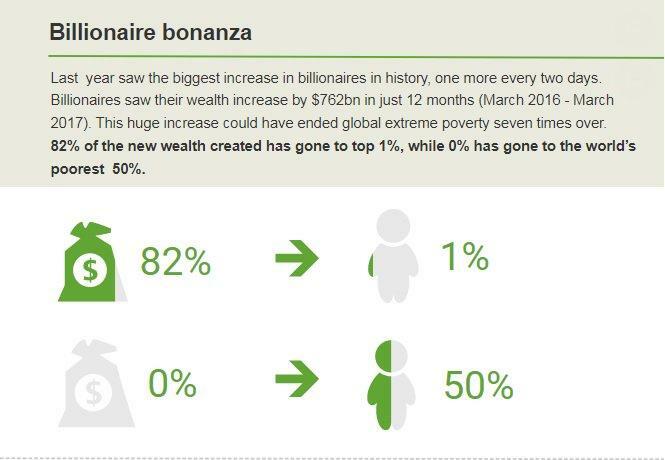 Among the other findings: the wealth of the super-rich increased by $762 billion in just 12 months to March 2017 which is enough to end extreme poverty seven times over. Nine out of 10 of the world's 2,043 billionaires were men. "The people who make our clothes, assemble our phones and grow our food are being exploited to ensure a steady supply of cheap goods, and swell the profits of corporations and billionaire investors,"said Byanyima. "The concentration of extreme wealth at the top is not a sign of a thriving economy but a symptom of a system that is failing the millions of hard-working people on poverty wages who make our clothes and grow our food," he said, and while he is right, the rich have little incentive to actually do anything about this record wealth divergence - besides pretending they are horrified by it, of course - at least until more Brexits, and more Trumps emerge, and eventually, a global uprising against the super wealthy. Over the next 20 years, the report claims that 500 of the world’s richest people will give $2.4 trillion to their heirs — a sum larger than the GDP of India, which has 1.3 billion people. Byanyima blamed “tax dodging” as one of the major causes of global inequality and urged leaders to crack down on tax havens and inject money into education, healthcare and jobs for young people. "[It] reveals how our economies are rewarding wealth rather than the hard work of millions of people,” Byanyima told Reuters, adding “The few at the top get richer and richer and the millions at the bottom are trapped in poverty wages." As noted above, the study was released on the eve of top political and business figures meeting at a luxury Swiss ski resort and private jet parking lot for the annual World Economic Forum, which this year says it will focus on how to create "a shared future in a fractured world". "It's hard to find a political or business leader who doesn't say they are worried about inequality," said Byanyima. "It's even harder to find one who is doing something about it. Many are actively making things worse by slashing taxes and scrapping labor rights."